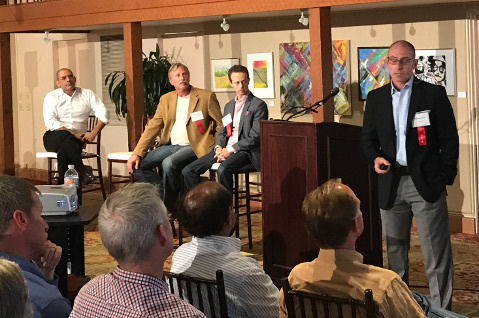 Michael Grillo (right), cofounder of Elite Garden, spoke to a group on the Business of Cannabis, joined by Max Simon, Paul Kowalski of the Cannabis Business Council of Santa Barbara County, and Adrian Sedlin. The big news to the cannabis industry at the MIT Enterprise Forum was that “a top 15 U.S. bank will announce a cannabis business platform within the next six months.” Adrian Sedlin, CEO of Santa Barbara-based Canndescent made the announcement, which could mean that the small fortunes being made by cannabis purveyors could soon be safely banked without threat of confiscation by the feds. The event on March 15 was very well attended, and seats were hard to come by. Attendees were treated to a light buffet at the Cabrillo Pavilion with East Beach and the blue Pacific in full view. The conversation was so engaging that the view was just a backdrop for most. Joining Sedlin in making presentations were Max Simon, CEO of Green Flower Media, who spoke about the dramatically shifting demographics of cannabis consumers. New users include everyday people and especially the aging population, who see this as a “wellness tool.” He went on to say, “There is an abundance of new delivery methods including oil tinctures and cannabis drinks that make consumption less socially awkward.” His site is a go-to for cannabis education.